"... it pleased God that in the city of Bologna, mistress of sciences and of studies, a most sublime genius should arise..."
Carracci's life was not one for the tabloids. His biography lacks the salacious sensationalism that could have helped to preserve his memory, as it did for Caravaggio. Instead, Annibale Carracci's biography offers the portrait of a shy, introverted man who, despite his undeniable artistic genius, never managed to make his mark in society. In Carracci's biography, Bellori recounts a likely mythical tale from the artist's youth. One day when he was but a child, Annibale Carracci accompanied his father to Cremona, where he had to sell off a small family farm. On their way back to Bologna, a group of peasants robbed poor Antonio of all his money. To the astonishment of all, when the father and son went to the police station to report the crime, little Annibale was able to draw a portrait of the robbers with such speed and accuracy that they were immediately identified and arrested, and his father got his money back. Like Caravaggio's Milan, Annibale Carracci's Bologna was in the midst of intense tumult at the end of the 16th century. A papal state since 1506, by the end of the century Bologna was in the throes of major reconstruction and a flowering of academic and scientific culture. At the same time, the region was experiencing a severe economic crisis caused by famine and plague which sent hordes of indigent peasants into the city to beg. As a child, Carracci would thus have been exposed to sublime beauty as well as to the horror of illness and poverty. Annibale Carracci's father, Antonio, was a humble tailor originally from Cremona, and his uncle Vincenzo was a butcher, the lowest of the low in Baroque Italy. Carracci's sisters stayed within this economic framework, marrying fellow members of the artisan class. In Bologna, artisans and shopkeepers occupied the bottom rungs of a society where the aristocracy reigned supreme. Due to economic instability, rising prices of essential materials like grains and an archaic, significantly weakened guild system, artisans were constantly threatened by job loss. Poverty was significantly on the rise during this period. Due to a lack of funds, Carracci himself was only able to stay in school until the age of 11. He started his career as a goldsmith apprentice. According to Bellori, as part of his goldsmith studies young Annibale studied drawing with his cousin, Ludovico Carracci. This confirmed artist recognized his immense talent and convinced his father to let him study art. Today it is generally accepted that he was apprenticed to the popular and successful local artist Bartolomeo Passerotti, who would end up becoming one of the staunchest critics of his young rival. During his youth, Annibale Carracci exhibited an idealistic, fiery passion for art. Dissatisfied with the stodgy Bolognese school of Mannerism and longing to see the masterpieces of the Renaissance, in 1587 Annibale and his older brother Agostino Carracci set off to seek their artistic idols. This trip would have a definitive influence on Carracci's style: Annibale was particularly struck by the art of Correggio, whose works kept him in Parma as his older brother went on ahead to Venice. 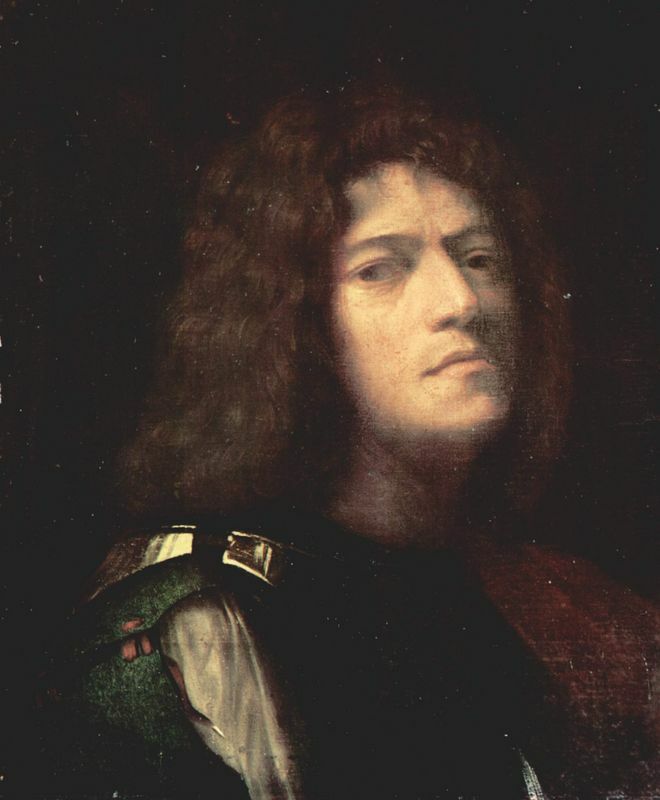 Annibale later met Agostino there and the two brothers studied masters like Titian, Giorgione and Tintoretto and were indelibly marked by the Venetian mastery of color and light. Annibale was not the only artist in his family. 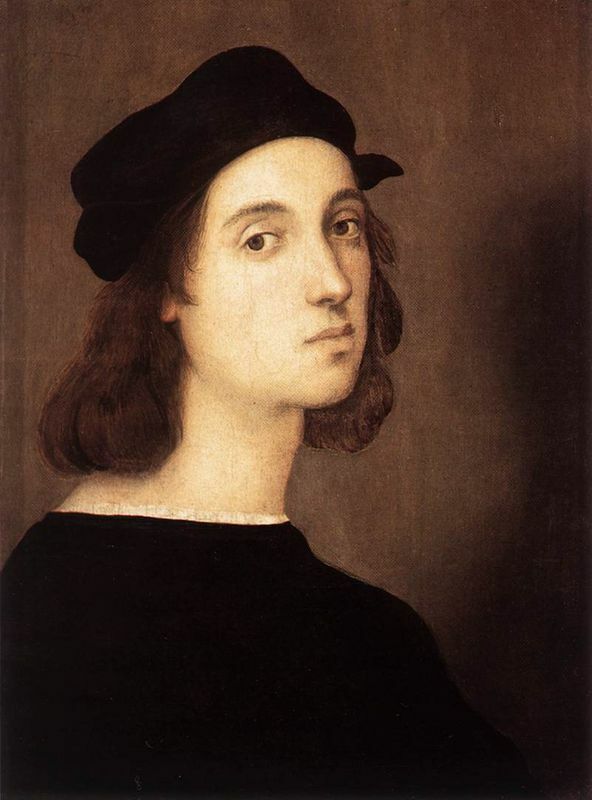 His brother Agostino was a talented engraver and cousin Ludovico was a painter with moderate success. All three young men shared the same ideals about art: they were against the obscure, false fantasies of Mannerism and called for an art inspired directly by nature. They decided to come together around 1589 to form the Academy of the Desirous in order to practice and disseminate their new way of thinking about art. At the Academy, the Carracci taught life study, proportion, anatomy, perspective and architecture. According to Bellori, young artists of Bologna rushed to study at this novel academy, but the school attracted scorn and displeasure in equal measure. The city's established artists were incensed at the impetuosity of these upstart young artists, who dared to open an academy without even having established their own careers. The Carracci undertook important public commissions together and emboldened by the idealism of youth, each artist refused to take credit for their work, proclaiming, "It is by the Carracci: all of us did it. " According to his biographer, it was Annibale in particular who was behind this collectivism, "for he was without envy and without ambition. " This personality trait would later prove to be his downfall. The idealism and brotherhood were not to last for long, however. The three artists soon took separate paths, Annibale and Agostino moving on to seek big-time success in Rome, while the unfortunately lesser-talented Ludovico stayed behind to run the Academy. By 1595, thanks to private and public commissions Annibale Carracci had secured himself a considerable reputation as a burgeoning young talent of significant potential. His reputation was considerable enough to catch the eye of one Cardinal Farnese, an enormously wealthy and influential Roman patron of the arts who needed a talented artist to execute frescoes for his Palazzo Farnese. 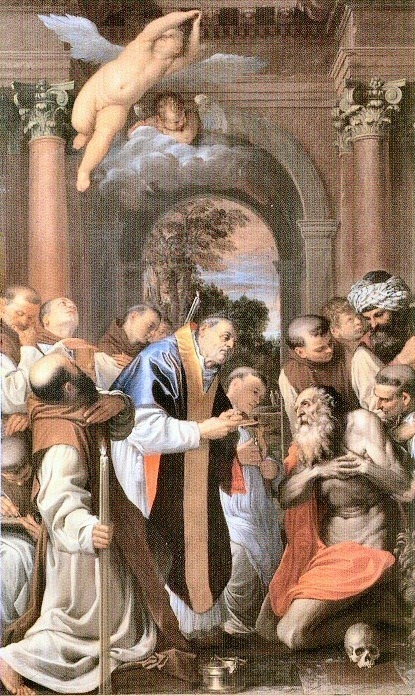 The Cardinal engaged Carracci with a contract of lodging, meals, and 10 scudi per month. 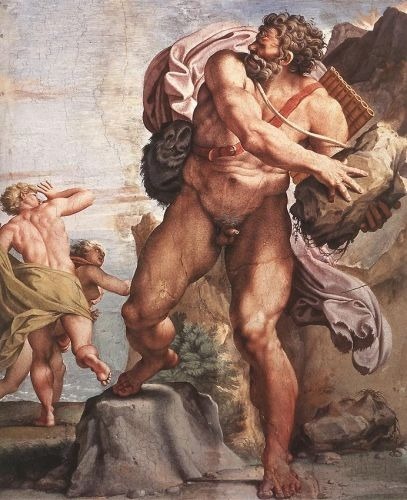 Carracci toiled on the Farnese frescoes for six years, works which constitute the very summit of his oeuvre as well as a landmark in the history of art. 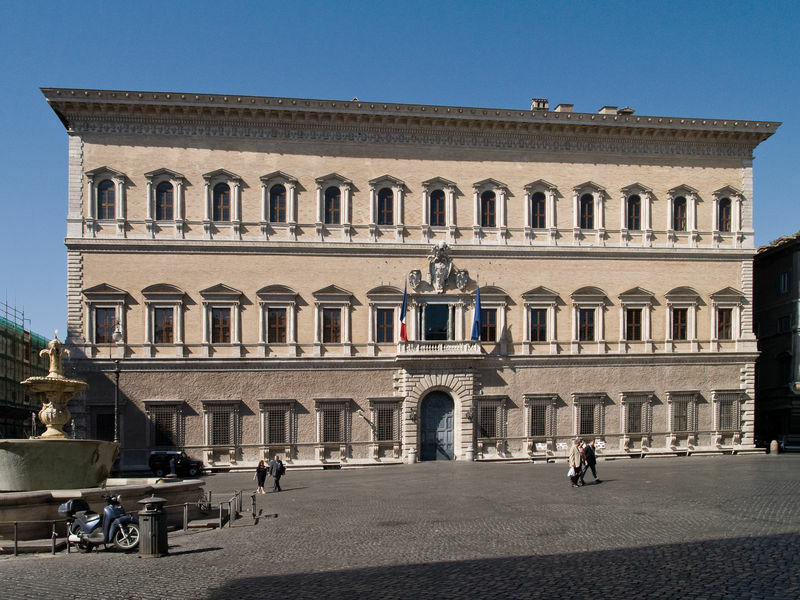 The Palazzo Farnese works represented a considerable investment for Annibale not only for his creative efforts and manpower, but because during these six years Carracci remained essentially shut off from the rest of the art world, unknown in Rome and essentially ineligible for other major commissions. Unfortunately for Annibale, the situation quickly proved not to be worth the sacrifice. Cardinal Farnese treated Carracci with scant respect, mocking the artist for his shabby clothes and quiet, stuttering manner. Carracci was loaded with menial responsibilities ill-befitting an artist of his talents: in addition to the Farnese Gallery frescoes, he was asked to paint canvases, design dishes and silverware and even make painted panels to be sewed onto the Cardinal's clothes. The ultimate insult was dealt when the time came for the Cardinal to pay Carracci for the finished frescoes, which were admired and lauded by all of Rome after being unveiled in 1601. Instead of paying the artist according to his merit, the Cardinal decided to add up the cost of all the food Annibale had consumed during his time at the Cardinal's palazzo and subtract it from the total cost of the work. He had the remaining amount, a measly 500 scudi, sent to Carracci on a silver platter: the ultimate slap in the face. A shocked Annibale Carracci accepted the payment without a word, speechless and dismayed. A melancholic and anxious man by nature, Annibale fell into a deep depression and moved out of the Cardinal's palazzo, determined never to paint again; "and he fell into a state of not painting anymore, and when he wanted to he could not, and was forced to abandon the brushes that melancholy took from his hand. " Despite the entreaties of his adoring students, Carracci refused to take any more commissions. To understand Annibale's reaction to this severe blow to his personal and professional pride, a closer look at the artist's personality is in order. Contemporary accounts reveal that Annibale Carracci was a deeply shy, introverted man, who was horribly uncomfortable amidst the elegance of the court and dressed shabbily, shunning the company of the aristocracy. After they moved to Rome, Carracci took on the personality of his brother, the loquacious Agostino, who prided himself on his flashy fashion and consorted with the knights of the court. On one occasion, Annibale encountered his ostentatiously dressed brother in the company of his friends, and told him: "don't forget you're the son of a tailor." Other anecdotes of Annibale Carracci's shy, unusual personality abound. On one occasion, Carracci allowed himself to be arrested and imprisoned for an entire night for carrying a sword in public, because he was too embarrassed to tell the police that he was in the service of Cardinal Farnese. 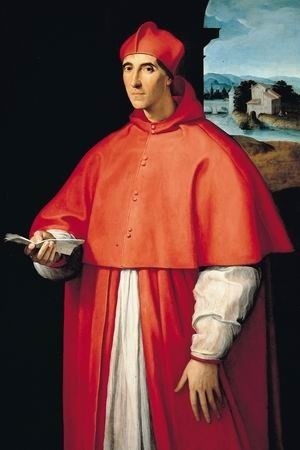 On another, Cardinal Scipione Borghese came to the Palazzo unannounced to pay the artist a visit and Annibale was so shy and disconcerted that he fled out of the back door of his room just as the Cardinal arrived. Shortly after the Farnese disaster, Carracci suffered from a stroke which apparently left him temporarily without speech and "disturbed his mind for some time. " He did manage to execute a few works during these last years, until he contracted a fatal fever and passed away on July 15, 1609. Carracci reportedly died with the words: "This time, my dear doctor, the workings of the clock are broken, you need not concern yourself with them further, they are beyond repair, the hours have run out." The artist was buried with the greatest of pomp and circumstance, finally achieving the recognition that he never received in life. 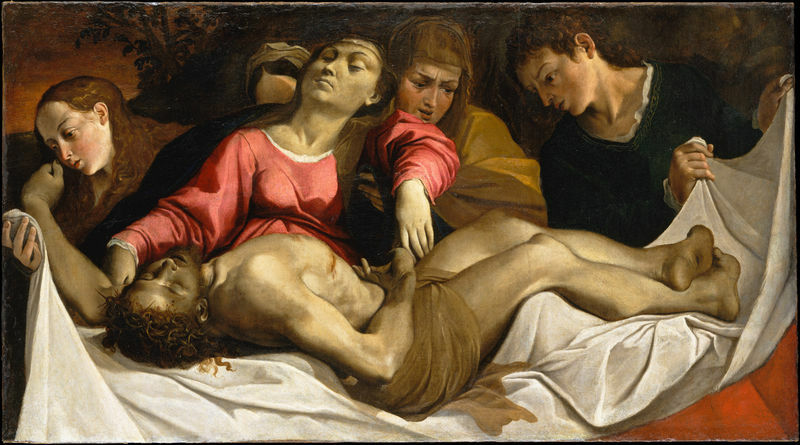 Annibale Carracci's body was placed on a catafalque and mourned by the Academy of Saint Luke (the painter's association in Rome) and Roman nobility, including some former patrons. 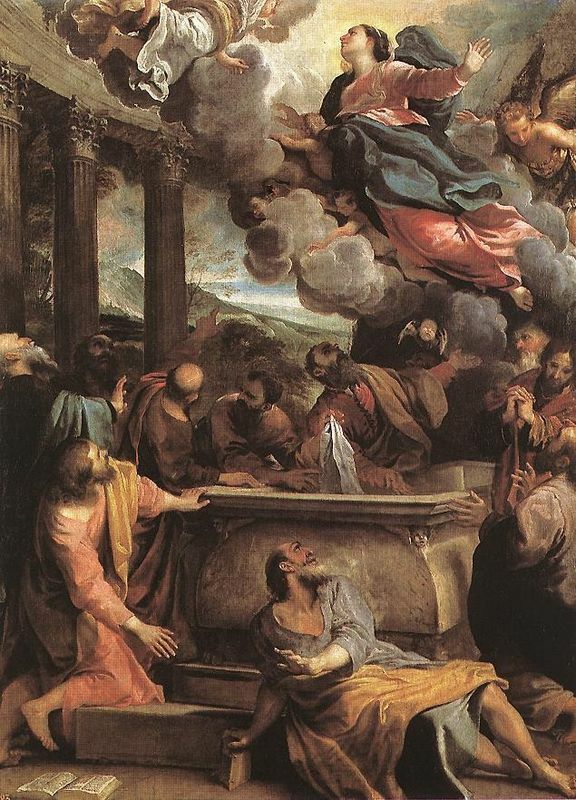 Carracci was buried next to his artistic idol Raphael, in accordance with his wishes.